Dave Owens and his son Nick decided to do a spot of bird watching in Northern Scandinavia. Here is their story. Both my son Nick and myself are birdwatchers and that was the principal reason for our trip which took from 4th to 26th June 2007. We took the Harwich to Esbjerg ferry, drove across Denmark (quite boring – looks like less interesting bits of the UK) and crossed into Sweden using the new (and expensive!) Oresund Bridge. Travelled up the eastern side of Sweden, into Finnish Lapland and further north, about 300 miles north of the Arctic Circle to the Finnmark Region of Norway. This is too far north even for fir trees to grow. It’s basically just tundra with quite a bit of snow about despite it being midsummer. (Continues below). We came back through western Sweden. 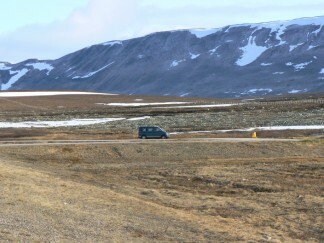 Scandinavia, particularly Sweden, is an ideal destination for camper-vans and mobile homes. In addition to having good campsites, there are many stopping places on main roads with excellent, well maintained toilet facilities including hot water. Also, their laws are quite liberal in terms of allowing “wild” camping. Interruption from the Bongomaster: In Sweden there is something called Allemannsrätt, or “Everybody’s Right”. This effectively means that, within reason, anyone can camp anywhereunder certain conditions, except on non-cultivated ground. Some of these conditions are: Max. stay 48 hours, no garbage left behind, and if closer than 150 metres to a house or cabin you have to ask the owner for permission. In all, we did in excess of 5,000 miles which was also about the number of mosquito bites we collected (up there, they bite you through your hair!). Didn’t experience any darkness for most of the trip. In fact, in the arctic, the best time for birdwatching is the early hours of the morning. The Bongo proved ideal for the trip. Never let us down and we only needed to use the diesel heating once with the weather being generally pretty good. I slept downstairs and Nick upstairs. On a few occasions, we rented a cabin for the night, just to allow ourselves the opportunity to “spread out” a bit.